1935 "FBI Raid Badge" - Only One Existing? FBI History Of The "Possible Club"
The History Behind The FBI's "Hogan's Alley"
SEE MORE Historical Links At Bottom Of Page! A copy of the original "Sloan Holster" Patent of 1966. For lawmen of years gone by, collectors and gun buffs in general, the "Sloan Holster" is sometimes a popular topic of conversation. Opinions vary with many on the popularity of the holster, the reasoning behind its creation, when it was patented, and monies made by Sloan while employed with the FBI. Through documents provided by the Sloan family, a small effort is made here to provide some answers to the lingering questions. "Hank" Sloan as a Texas Department Of Safety (Highway Patrol) motorman. No doubt many retired special agents will recall being issued the holster, and many outside lawmen will recall purchasing it. "Hank" Sloan came to the FBI, like many of his time, from local law enforcement in 1935. In fact, many of the FBIs legendary figures of that era came from local law enforcement. Today, as in the past, the FBI still recruits special agents from local departments around the country. Whenever it was mistakenly started, various readings on and off the Internet place Sloan's pre-FBI career with the Texas Rangers. While some of the recruited officers of the day came from that department, and perhaps even some of his classmates, we know from evidence available that Sloan was employed with the Texas Department of Safety (TDS) as a motorcycle patrolman. Two areas of evidence refute any employment with the Texas Rangers. Namely, the biographical sketch of her father by Sloan's daughter, "Letty," reveals TDS employment. This is further supported by Sloan's actual application for employment with the FBI. An examination of that 1930s application from his personnel file reveals TDS employment, with no mention of any time spent with the Texas Rangers. There are ample photos in existence showing Sloan in a TDS uniform, some showing him with his motorcycle of the era. Beginning his FBI career in 1935, most know the legacy of "Hank" Sloan for his efforts in the overall construction of the FBI Academy during the period beginning in 1939. Years later, Sloan would become the Special Agent In Charge (SAC) of the Academy; a position that would seal his place in FBI history. Sloan's invention of the holster named after him actually occurred in the era surrounding 1964 according to documents supplied by the family. "SAC Sloan, Quantico, Va. has invented an adjustable holster, sample enclosed, to fill a long felt need for the proper fit of a revolver in a holster without use of security straps and to provide one holster to fit both S & W and Colt revolvers of different models." "I am very pleased to commend you for your ingenious invention of an adjustable feature to be used in the manufacture of leather holsters for different makes of handguns..." "...its use will surely prove to be most advantageous to Bureau agents." "For many years the FBI has supplied its Agents with tilted, quick draw holsters purchased in two sizes; one to fit the Smith & Wesson Military and Police Revolver, and one to fit the Colt Official Police Revolver." 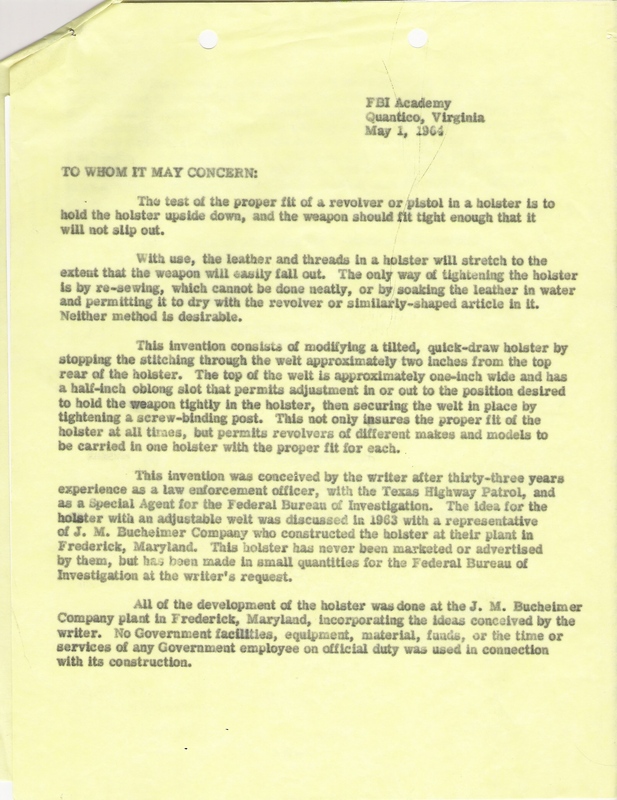 During the 1963 period, the Bucheimer Company began producing limited amounts of the "Sloan Holster" for the FBI. One subject area of this relationship with Bucheimer and Sloan should be made perfectly clear. The FBI's purchases from Bucheimer were "royalty free." At no time (my emphasis) did Sloan collect any royalties on the holster with regard to sales to the FBI. This is abundantly clear in FBI documents. It's also very clear that during the invention period of the holster, circa 1964, Sloan conducted proper written notifications to the Bureau's Legal Unit who provided opinion on the matter, and in turn, the Bureau properly notified the Attorney General's office. Several years later, prior to sales made by Bucheimer to outside parties, Sloan had discussed the "ethics" of any advertising with the Bureau's Legal Unit. As far as Sloan's motives with his invention, opinions vary at times as to what he was trying to accomplish with the holster. We now have documentation revealing a memorandum submitted by him to his superiors at the FBI revealing his thoughts. For the first time, we can read in his own words the motive behind his holster design. Page 1 of this document can be seen here. The second page of the existing memo can be found here. 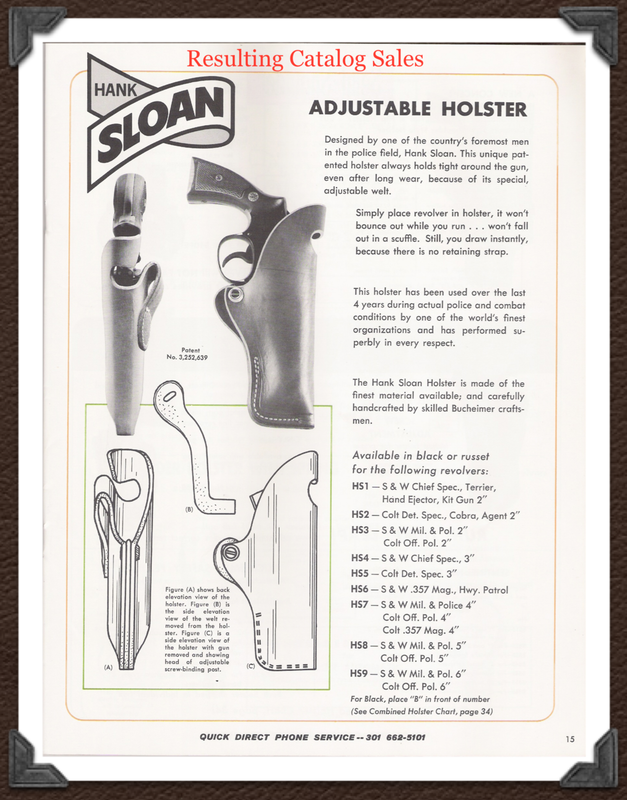 The "Sloan Holster" as it appeared in Bucheimer's catalog. Sometime during or just prior to 1964, Bucheimer attempted at one point to obtain a patent on Sloan's holster invention. The patent was denied them citing Sloan as the original inventor. Obtaining his patent in 1966, and after working out "the bugs" of the holster's design and use, by 1967 everyone involved was ready to offer the "Sloan Holster" to outside law enforcement departments. Both the FBI and Sloan himself made it very clear to Bucheimer in no uncertain terms that the use of "FBI" was not allowed in the advertising campaign. Sloan's name and his law enforcement experience could be used, but not his affiliation with the Bureau. The resulting advertising by Bucheimer would, in fact, be devoid of any mention of the "FBI." While Sloan could not collect royalties in sales to the Government (FBI), he was allowed by contract with Bucheimer to collect royalties on outside sales during his FBI employment. Documentation reveals that this matter of collecting royalties was thoroughly discussed with his superiors, the Legal Unit of the FBI, and the Department of Justice. One page of Sloan's contract with Bucheimer reveals the particulars of the deal. The "Sloan Holster" would sell retail for $4.80 and Sloan would receive $.25 (twenty fives cents) on each holster sold. Page 1 of that contract revealing these numbers can be seen here. Regardless of what former or current lawmen have heard over the years, or what information has been passed on gun forums and/or Internet exchanges, the amount of money made by Sloan in sales might be surprising to some. The high point of sales appears to have been the initial period of January, 1967 to July of that year with sales amounting to just over 1900 holsters. This gave Sloan a royalty check of just over $400. In our conversations with the family historian, he had made available documentation revealing royalties of this period. Information exists that after this initial royalty payment, the remaining ones were lesser amounts as sales diminished over time. "The Hank Sloan plain clothes holsters arrived safely and have been wearing one ever since. To my notion this is the best plain clothes holster yet designed as it does away with any need for a safety strap of any kind and you can turn somersaults and still the gun stays in the holster yet can be draw as fast as any if fits waits belt tight." (sic) Keith's letter and opinion on the holster's concepts can be seen here. "Hank" Sloan and SA Bill Espey during construction of the firearms ranges, early FBI Academy circa 1940. Courtesy Sloan family. The FBI Academy today bears little resemblance to the Academy of SAC "Hank" Sloan. The "Sloan Holster" has been gone from the FBI's inventory for decades. Once issued to all new special agents, the holster is old. Those who wore it are retired and are getting older too. With the changes in designs of the day, and with newly issued automatic handguns, Sloan's holster became part of FBI and firearms history. So did the "wheel guns" that sat within them. Today you might find one of Sloan's original holsters at an auction site, sometimes advertised as a "collector piece." Some might get lucky and find one lying dormant in a box of sordid old holsters at a gun show. With those listed on the Internet, we've seen prices ranging from about $40 to $80 each. Sloan's grandson is currently employed in a supervisory special agent capacity at the FBI Academy. We thank the Sloan family for providing the documents shown/mentioned here and seen on this site. More about "Hank" Sloan and the history of the FBI Academy can be found by using the "search" link in the upper navigation area of this website. New Book! Murder Of A G-Man! 1930s FBI Weapon "Hard Cases"
Hoover; Eliot Ness & The "Untouchables"
Alvin Karpis Arrest: Where Was Director Hoover? When Karpis "Bought The Agents Dinner"
Intent To Kill: Dillinger & The "Soap Salesman"
East Chicago PD Wanted Dillinger Dead? Agent Statements: What Happened At The Biograph? Dillinger's Wooden Gun: History Lost?